Jill has just mailed off the latest beauty from the Murfreesboro Sewing Ladies group to a soldier in Afghanistan. His wife is a student at MTSU that crossed my path. Tyler is stationed at Camp Leatherneck. The ladies made string blocks, sewed them together, Jill put on borders and passed it on to a longarm quilter. Last Tuesday, I saw ladies sewing on the binding. And by Friday it was on it way to Tyler. Jill also filled the box with other items he and his buddies could use over there - snacks, chap stick and other items the group made - pillowcases and cooling ties. Hopefully Tyler and his buddies will know we are thinking good thoughts for them and feel how much we appreciate their efforts to keep us safe. Half square triangles make most new quilters cry. Not Jessica!! I had all the sizes of squares cut out, drew a really bright white line down the middle of the squares and off she went. We found that it worked out pretty good if we moved the needle all the way to the right and she lined up the line with the indention in the front of the presser foot. Worked like a charm! Look at the 1/4 inch seam! Jessica chained pieced these guys together, flipped over the chain and stitched down the other side. I think maybe she has done this a lot and just messing with me!! I pinned pieces together and laid them next to the machine, she picked them up, sewed on the side of the pin and we had an assembly line goin'. We even got Dan in on the act - he was truing up the half square triangles for us so we could zoom thru this project. Our next time together we will start sewing this tip together and I think will have it done. I am going to make the eight remaining Bear Paw Blocks so that we can just put borders together. Basically just Bear Paws as corner stones and borders. Quilt ends up having three of them. Yeehaw!!! My daughter knows the coolest people!! One of her friends is getting married in May and because his partner, Michael, is also male, Michael family has just not jumped on the "We are so excited!!" train. But Danielle has and I have and now Ryan is finding that family can be very loosely defined. Micheal loves quilts. And in his family, it is a tradition for the family to make a quilt for the happy couple. This is not gonna happen for Ryan and Michael and when Danielle heard about this, of course, her first response was "Well, my mom will make you a quilt then!" Ah, the naivite of the non-quilter. It is a thing of beauty. But, of course, she was so right! 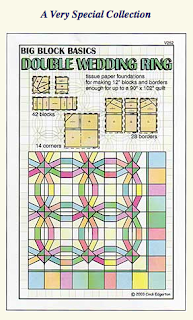 Ryan wants a double wedding ring quilt by May - May 2nd to be exact. Well, I may be crazy but I am not totally nuts. He will be married in Canada on May 7th and then have a big party in Nashville in August. Our agreement was that by THE FIRST WEEK IN MAY he could have a lot of progress but no finished quilt!!! He is gonna make a scrapbook of this wonderful process and will give that to Micheal for their wedding. Then, in August, they both will get to see the whole thing - done!! Yes, ladies and gentlemen, I am going to have the quilt DONE in time for the party. But, as is always the case, I can not do this alone. I put out the call to my girlfriends, told them the plan and that I needed fabric to flesh out Ryan's wish list and the response broke my heart!!! All you great girls stepped up to say "I'm in! What can I do??". I have a beautiful watercolor calligraphy a friend made me of this quote: "The bond that links your true family is not one of blood, but of respect and joy in each other's life. Rarely do members of one family grow up under the same roof." Richard Back, Illusions Ain't it the truth!!! 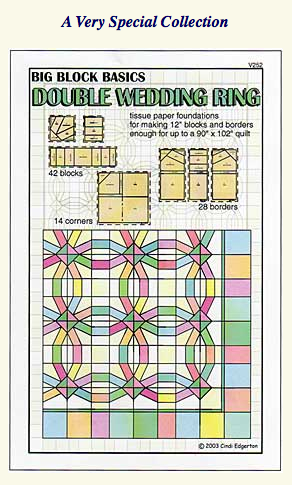 I have just ordered a Cyndi Edgerton Paper piecing pattern and that will be arriving soon. I love, love, love paper piecing and I thought this would keep me organized. We'll see. . . I do love her tissue paper foundations. I had always thought not, but I make a Halloween panel she designed and the tissue was TREMENDOUS!! I am a convert!!!! I asked everyone to send in fabric (like a piece at least 5" x 5") and that would make up the scrappy rings. Ryan's list includes these topics: bears, love, UK (University of Kentucky), UK-Wildcats, carpet, painting (like house not artwork), country music, music, Patsy Cline, Garth Brook, Dolly Parton, Grand Ole Opry, Kentucky, Wisconsin, children, cars, cars, cars and MORE cars, cabin, country, vintage, classic, flannel, denim, water, parks, flowers, trees, Jack Russell Terrier, reading glasses, Canada, August, May, March, June, COOKING, food, green, teal, brown, family and boats. 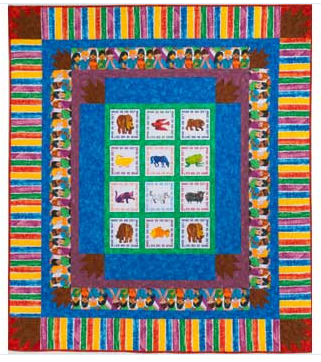 Now this is gonna be one cool quilt! I love everything about the whole idea. Yeah, that is what family is about and Ryan and Micheal have no idea just what crazy women are now in their family. They are about to find out. I'll keep a running log of what is happening here, you all can join in the fun and Ryan will at least have some colorful pictures to show MIchael on their wedding day! Well, I don't know that we got a lot accomplished but we sure did enjoy ourselves. Mostly we spent time drooling over everyone's strip sets! The fabrics are just delicious. And you will notice that I didn't follow the class syllabus - everyone is making this beautiful piece cut from 1 inch strips. Mine is cut from 2 inch strips and is gonna be just a tad bigger. What else is new? Jan, our brave instructor, has started another bargello just for our class! She wanted to sew, too! And this is my set up at home in my studio. I can get better organized with everything pinned to the design wall. I have 4 whole strips sewn together!! You can see the design started to form. This is gonna be one beautiful piece when I get it finished - in 2037!! Ok, it's midnight here. Got all 8 strips sets sewn and four of them starched and ironed. Four more to starch and iron and I am in the bed. Think 6am is gonna come awfully quickly.